Cape Town - With the launch of its latest 5 Series earlier in March 2017, there have been seven-generations of BMW's 'nearly 7' in South Africa. For the last two decades, BMW’s 5 Series has been generally agreed upon as the ‘best real world car’ you can buy. The ‘Werke’s most ardent fans still regard it as the quintessential BMW: limousine like qualities of 7, with the agility of 3 Series. 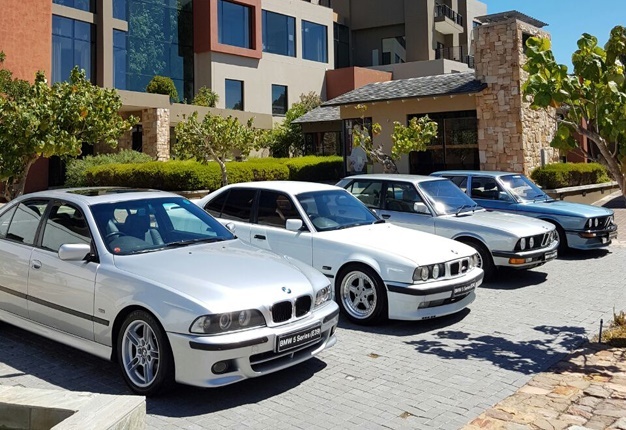 South Africa, as both a destination market and erstwhile producer of 5 Series, has a storied history with BMW’s archetypical luxury sedan, detailed by interesting local derivatives and homologation specials. BMW’s original 5 Series was the departure for Munich’s claim to differentiate itself in the luxury sedan market, as a resource of rewarding drivers first, passengers second – unlike rivals of the time, where dynamics were subservient to comfort constrains. The E12 was available in South Africa for longer than any other global market, with production continuing at Rosslyn until from 1974 to 1985 – well after international distribution had ended, in 1981. These cars were to become known as E12/8s, using the suspension, cabin bits and electronics from the second-generation 5 Series, in the original E12 shell. Although E12 did not birth the legend that was to become M5, a South African homologation special did illustrate what was possible: 530 MLE. A mere 218 of these very special 530 MLEs were assembled, a number double that of BMW South Africa’s original product planning, which set aside an allocation of only 100 for 1976. The intent was to legalise its saloon racing car, not generate interest and deliver a cult car. Demand was stupendous; hence the additional cars being built in 1977, and for many 530 MLE remains not only the original African M5, but also the first-ever M-car proper. Twin-Zenith carburettors and a camshaft of the appropriately wild duration helped 530 MLE’s 3.0-litre in-line six produce 147kW and 277Nm. Bilstein dampers made it more agile, ventilated brakes helped it stop consistently and a short-ratio Getrag five-speed transmission ensured a sub-10 second 0-100km/h tie. The quest for lightness was obsessive: door-hinges were amongst the 530 MLE components to be drilled for lightness and the battery was located in the boot. Tragically, most 530 MLEs were racing either on circuit of public roads, and precious few of the original cars survive in 2017. BMW’s second generation 5 Series, retained much of the shark-nose styling established by E12, masking a tremendous evolution in technology. This was the first 5 Series with optional ABS (in the 1980s, a very rare thing to have option on) and heralded the start of BMW’s driver-centric ergonomics: with centre-stacks angled to the right (in SA). It had the shortest life-cycle of any 5-Series in South Africa, arriving late in 1985 and being replaced in 1989. Again, Rosslyn managed to produce something fantastically unique for South African four-door BMW performance fans. With E28 being the true debut of M5, South Africa was delegated the notable responsibility of being original M5’s only assembly-point outside of Germany. In total a mere 96 South African market M5 were ever built, making them terrifically collectible in 2017. Distinguished from all other E28 M5s globally by their Shadowline trim and cross-spoke 16" alloys, they retained mechanically similar to the cars built in Germany, with 232kW of legendary M88 3.5-litre in-line six. Inside there was premium Nappa leather cabin trim, ordinarily only available on contemporary 6- and 7-Series at the time and the only option available on these comprehensively specced South African M5s, was a sunroof. As the 1980s drew to a close and Germany was on the cusp of its historic path to reunification, BMW released its third-generation 5 Series, the E34, a car with boldly square proportions and a styling language completely unrelated to what had gone before. This was truly the first 5-Series to combine the presence and luxury of a 7 with the driveability of a 3; as such the ‘best buy’ model – 525i - was crowned South African car of the year in 1990. The ‘Ronin’ BMW would eventually debut a range of technologies for 5-Series: stability and traction control, with additional safety features such as airbags too. 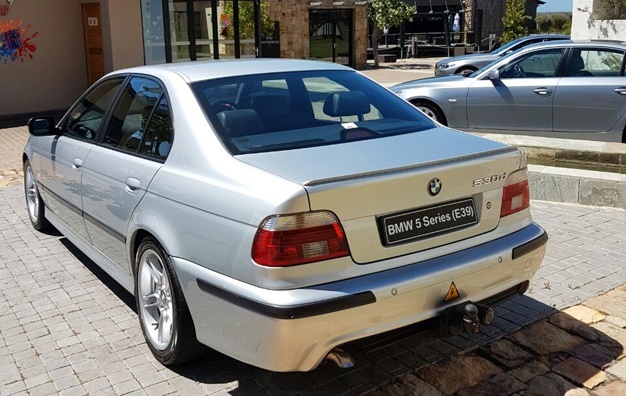 Although E34 would also usher in the first V8 engines for a 5 Series, the M5 variant remained true to its in-line six heritage, with a 3.6-litre version of the legendary S88 engine, rated at 232kW. 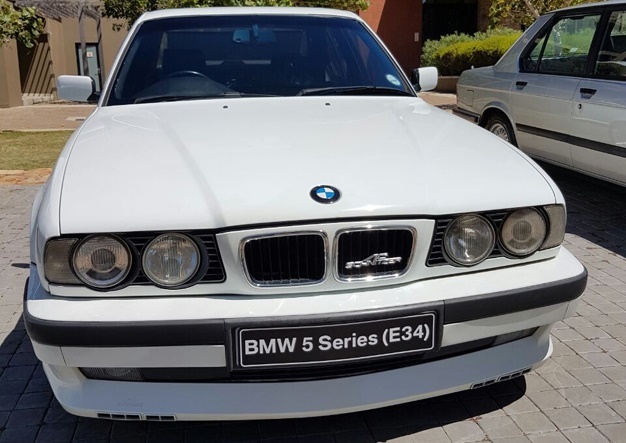 In 1992 M5 gained 200cc of swept capacity, to 3.8-litres, with power rising BY 18 units 250kW, unfortunately none of the 297 E34 M5 sold in South Africa were of the latter. Interestingly, unlike other E34 M5s, the South African cars were not built by the M-Division in Germany, but assembled locally, at Rosslyn, from CKD kits. Almost by default, BMW’s 540i, with its six-speed automatic transmission and 4-litre V8 engine, became the default ‘M5’ for local buyers towards the end of E34’s lifecycle. The car that established the notion of 5-Series being the ‘best-car-in-the-world’. Styled by Japanese designer Joji Nagashima, it was an elegant evolution of E34, with advanced aluminium structural components. Deeply impressive, the 528i was South Africa’s Car of the Year in 1997, and 12 months later, BMW would reveal its first-ever V8 M5, the legendary 298kW E39 M-car; one regarded by many as the best-ever sounding BMW that was not an in-line six. As the 20th century become the 21st, BMW was preparing its most controversial 5-Series of all: the E60, which launched in 2004. It was a Chris Bangle design and like all BMWs of the time, deeply divided opinion. What E60 perhaps lacked in styling elegance, it made up for in the unique componentry of its M5 version: with a V10 engine benefitting greatly from BMW’s involvement with Williams F1. Most collectible of all were the very limited number of M5 Tourings imported to South Africa, the first and only M-Division station wagons ever to be landed locally – and cars of esteemed cachet. Ultimately, though, 5-Series would have to wait another generation before it received its first South African accolade of the 21st century, as F10 would be crowned Car of the Year in 2011, with 530d taking the title. An important shift in powertrain offering occurred with F10 5 Series, as diesels became prevalent and the first turbocharged M5s followed. Of the latter, South Africa would also receive a unique RHD Pure Metal edition M5, essentially a 30 Jahre Edition engine upgrade, with special seats and the unique Pure Metal surface finish.